10 August 2011 – Brendan Wood International today released the results of its debriefing with the most transactionally active UK companies. Many corporations globally are sending a greater amount of their strategic investment banking fees to boutiques. TopGun bankers are selecting boutique life as an alternative to big bank bureaucracy and compensation retention. 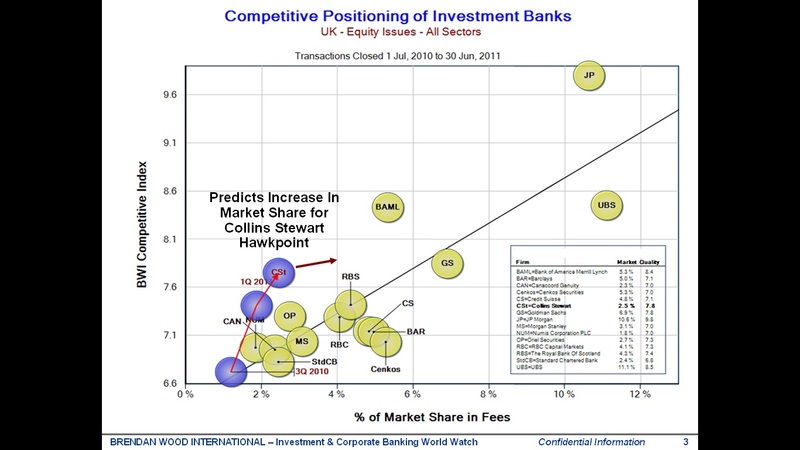 Collins Stewart Hawkpoint ranked as one of the brokers most predicted to grow market share in the equities business. Its share of TopGun bankers climbed significantly, as did its research ranking and number of clients with planned deals. The number one ranked broker continues to be JP Morgan. 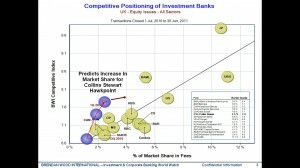 Bank of America Merrill Lynch ranked first for number of TopGun bankers, and was also positioned to grow market share. UBS ranked most vulnerable to a market share loss. For initial distribution to the Brendan Wood Panel consisting of over 4000 shareholders, corporate executives, corporate directors, TopGun analysts, TopGun bankers, and other leading banking executives.